Although I used it for uneven bamboo pillars, it is easy to use and soft, so it is hard for vinyl to be scratched. I want to order again. This review is about item#8466142. I used it for a 20 mm pillar. I can firmly fix it, but I had a hard time doing a stopper. Is not it better to use it with a post smaller than 20 mm? You can use up to 20 mm, but the correct answer. This review is about item#8466158. If it is a conventional packer, there is a spring, there is a case that it takes considerable force to attach and detach, and it got out of fingertips. It is easy, as it can easily be removed. Farm work, fixing vinyl sheets etc. 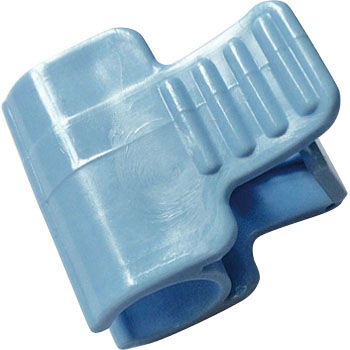 When installing, it is easy to use As you extend the clip part when removing the stopper A slight technique is necessary. Blueberries have flown every year and covered the net in the fruit season. Since the harvest of this year is over, I am planning to make a hut of netting bird net while pruning. In order to stop the net on the pillar, workability gets worse if it is a regular packer, so I decided to stop it with this simple packer in a simple way. Will it really improve workability? I am looking forward to it. Until now, I fixed the post and the net with a string, but this product can be fixed with one touch. What was the hard work so far ... It was a very convenient item and it would have been better if I bought it faster. When it was a conventional packer, the force was put on the removal, the fingertips had become sore, but as this is easy to remove, it is good to purchase. Although the lengths of the knobs are the same, I think that it is easier to handle, as the length of the hooked knob is slightly longer. I use it to stop the tomato pillar roof, vinyl. It is pretty solidly stopped. It is used to fix the net to the support. I am satisfied because I can quickly close the net. Concern ① Damage to packer tightening parts is a concern due to UV degradation. ② It is worried that it will be removed from the pillar when it is hit by strong winds. Since it has a latch, it can be fixed firmly. It was very usable and so I repeated it. Although it is inexpensive and easy to use and satisfied, there are some things that the knob breaks in around a year. I rent a family garden and are currently making various crops. Used to fasten the vinyl sheet to the pole. Purchased with a vinyl sheet of tomato tent. It is easy to use and affordable. I have been using it for several years. Since it can lock firmly with ticks, the net does not loosen or bends, so it will be saved. Since there are two sizes, it is also good to match with the size of the stick. This review is about item#08466158. Installation and removal is very easy. Furthermore, because there is a latch, it can be applied even if the strut thickness is somewhat narrow. There is a latch part for tightening, and even if some deformation occurs, it can be used with confidence. Vinyl is harder to break compared to others If you lower prices a little more, you may buy two if you buy two. . . . . This review is about item#08466142.